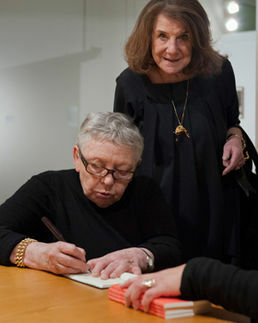 Jacqueline de Jong and Michèle Bernstein, Moderna Museet, 25 February 2012. Photo: Åsa Lundén/Moderna Museet. Jacqueline Beatrice de Jong (1939) is a Dutch painter, sculptor and graphic artist. 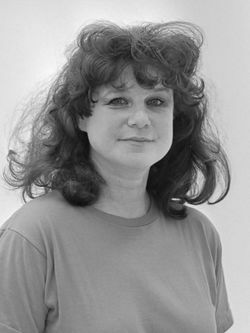 She was a member of the Situationist International (1960-1962), and went on to create The Situationist Times (1962-1967), an experimental, international, English-language review concerned with Situationist ideas like détournement as well as other concepts such as topology. De Jong was born in the Dutch town of Hengelo to Jewish parents. Her father’s company made seamless stockings for Dior. When the Nazis invaded Holland, two-year-old Jacqueline crossed over the Jura mountains with her mother, while her father hid out in Amsterdam. After the war De Jong went to school in Hengelo and Enschede (Gemeentelijk Lyceum), and later moved to Paris, where her father found a position for her at Dior. She met Asger Jorn in the company of her father, when he bought one of Jorn’s pictures. The family collection included works by several CoBrA artists, a Franz Kline, and many other fine contemporary works. In 1958 De Jong was in Holland, working as an assistant in the Applied Arts department at the Stedelijk Museum (until the end of 1960). The Situationists were involved in a somewhat fraught collaboration with the Stedelijk, which brought De Jong into contact with them. She joined the Situationist International in 1960, and started to participate in conferences and the Central committee. After the expulsion of Constant Nieuwenhuys, she became the Dutch Section of the organisation. In 1962, she did not accept the way the German section, also known as Gruppe SPUR, had been expelled and resigned. 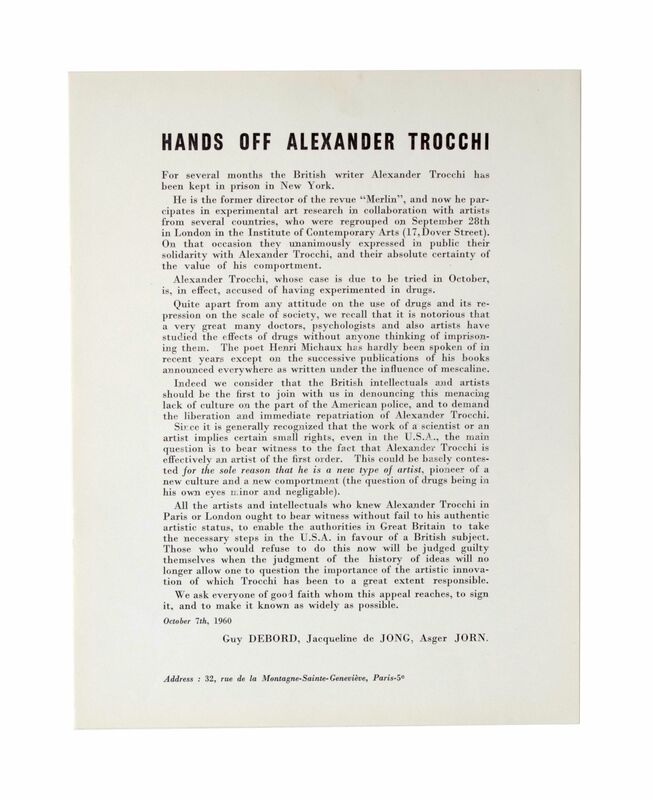 The cleft between the Debordists and the Second Situationist International grew, however she refused to join either faction, instead stating that people should act as situationists. Between 1962 and 1967 she edited and published The Situationist Times. In 1968 she was in Paris, printing and distributing revolutionary posters. In 1970 De Jong left Asger Jorn and moved to Amsterdam with Hans Brinkman, a gallerist. They divorced in 1989. In 1990 she became the companion of lawyer Thomas H. Weyland (1931-2009). Together they started The Weyland de Jong Foundation in the early 2009 to support avant-garde artists aged 50+. In 2003 a retrospective exhibition of her work was shown at the Cobra Museum in Amstelveen, the Netherlands, and the KunstCentret Silkeborg Bad, Denmark, whereas a monography was published under the title Undercover in de Kunst/Undercover in Art. In 2019, Stedelijk Museum in Amsterdam staged a new retrospective of hers (see accompanying video, 6 min). De Jong's archive was acquired by Beinecke Rare Book & Manuscript Library, Yale University in 2011-2013. Folie endormie, Paris: Jorn, and Munich: Bleicher, 1962. 17 etchings. Accidental Paintings, 1964, 12 pp. Exh. held at the Galerie Westing, Odense, 19 Sep-12 Oct 1964. Jacqueline de Jong, Amsterdam: Kunsthandel Krikhaar, 1965. Exh. held at the Kunsthandel Krikhaar, 21 Dec 1965-16 Jan 1966. Jacqueline de Jong. Billiard Paintings, Amsterdam: Galerie Brinkman, 1977,  pp. Text by Ed Wingen and Jean Clarence Lambert. Exh. held at the Galerie Brinkman, Amsterdam, 24 Sep 9 Nov 1977. Jacqueline de Jong. Arbeiten 1960-1963, forew. Roberto Ohrt, Munich: Galerie Helmut Leger, 1990,  pp. Exh. held at the Galerie Helmut Leger, Munich. Jacqueline de Jong. Malerei 1964/65-1991, Munich: Leger, 1991, 38 pp. Exh. held at the Galerie Helmut Leger, Munich. "Werken 1961-2002 / Works 1961-2002"
Margriet Schavemaker, "Pinball Wizard: An Introduction", Stedelijk Museum Amsterdam. 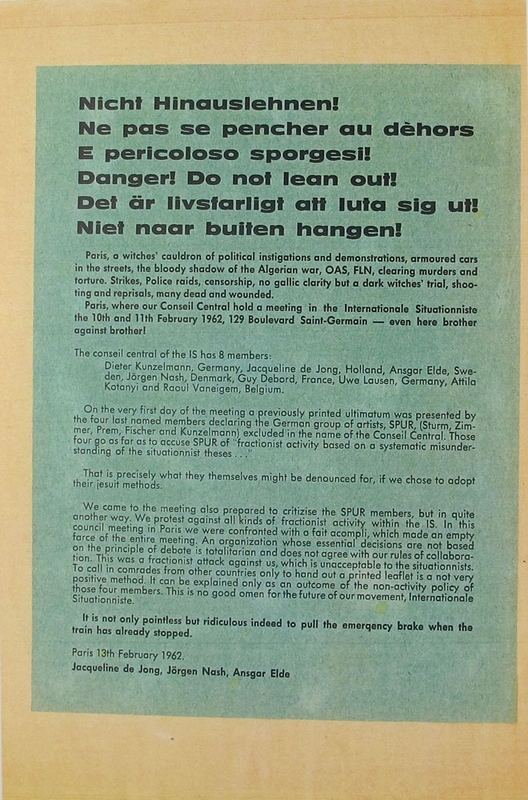 Ellef Prestsæter, "How to Read The Situationist Times". "Pinball Wizard: A Conversation between Margriet Schavemaker and Jacqueline de Jong". Karen Kurczynski, "Ladies and Gentlemen: New Morphologies in The Situationist Times". Laurie Cluitmans, "From Place to Situation and Back Again: Jaqueline de Jong in the 1970s and 1980s". "Walk through the exhibition". Audio. Margriet Schavemaker, L'imagination à rebours: An Interview with Jacqueline de Jong, The Hague: Dürst Britt & Mayhew, 2017, 4 pp. Adrian Dannatt, "Undercover Agent: Painter, publisher, revolutionary and provocateur - Dutch artist Jacqueline de Jong has done it all", The Guardian, London, 7 Jun 2003. Review of De Jong's retrospective at Cobra Museum. This page was last modified on 13 February 2019, at 21:22.